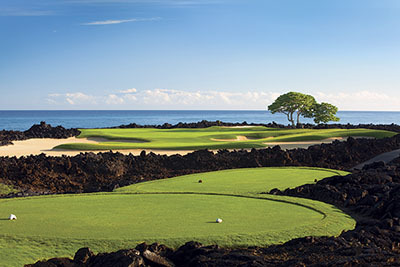 For the fifth year running, The Lodge at Pebble Beach claims first place on the list of the Best Golf Resorts, and the Four Seasons Hualalai and The Sanctuary at Kiawah Island Golf Resort remained firmly in the top five. 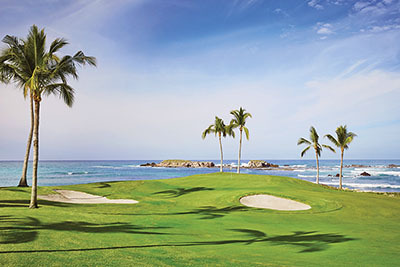 Remarkably, only four of the 20 hotels on this year's list are international golf resorts and domestic favorites cluster in Hawaii and California. Pebble Beach, California — Distinguished resort dating from 1919 with glorious views of Carmel Bay and the 18th green of the famed Pebble Beach links, a short drive from Carmel. Low-rise annexes contain 161 guest rooms and suites with large baths; most have woodburning fireplaces and outdoor patios or balconies. 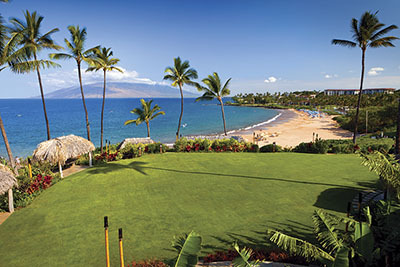 Maui, Hawaii — Luxurious resort on 15 oceanfront acres at the south end of Wailea Beach. A U-shaped building contains 380 spacious rooms (75 suites) overlooking landscaped courtyards, all offering lavish marble baths with deep soaking tubs and furnished lanais. 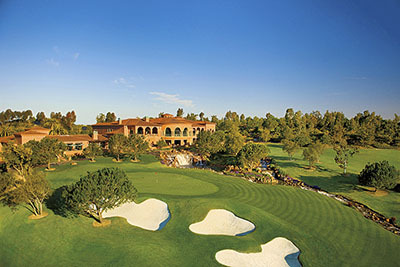 Three 18-hole championship golf courses are adjacent to the property. 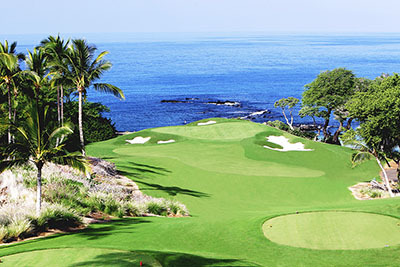 Kailua-Kona, Hawaii — Grand resort on dramatic grounds along a half-mile rocky shoreline on the north Kona Coast. Four lodging crescents house 243 stylishly appointed rooms featuring lanais and lavish baths. The spa is the island’s best for alfresco treatments; also seven pools, tennis courts, manicured Jack Nicklaus-designed golf course. Carefree, Arizona — Imaginative 221-room resort and spa that blends into dramatic outcrops in Sonoran Desert foothills, 30 minutes north of Scottsdale. Adobe-style casitas come with Southwestern accents, private patios or balconies. Amenities include eight tennis courts and two 18-hole Jay Morrish-designed golf courses. 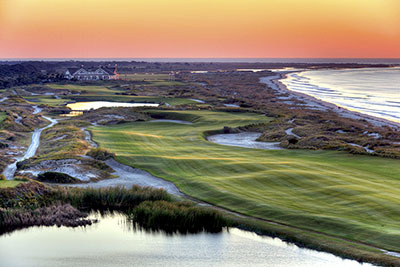 Kiawah Island, South Carolina — Beautifully appointed resort set along a 10-mile beach on private Kiawah Island. The four-story hotel contains 255 casually elegant accommodations outfitted with every conceivable amenity. Five championship golf courses designed by the likes of Pete Dye, Tom Fazio, Jack Nicklaus and Gary Player. 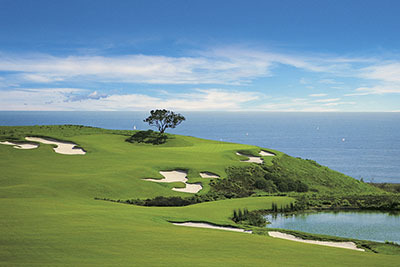 San Diego, California — Elegant 249-room Mediterranean-style golf and spa resort adjacent to a 4,000-acre nature preserve. Opulent interiors evoke the style of famed 1920s architect Addison Mizner. Lavish 21,000-square-foot spa, plus gym with yoga classes, four heated pools, tennis, equestrian center and Tom Fazio golf course. Newport Coast, California — Lavish resort on 504 acres south of Los Angeles, in the hills overlooking the Pacific. Featuring a circular courtyard, ochre-hued walls, graceful arches and tiled roof, this Italian-inspired property features 204 bungalow rooms and suites, a fine formal restaurant and two Tom Fazio championship courses. 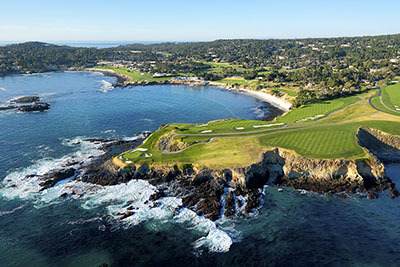 Pebble Beach, California — Appealing sister resort of the nearby Lodge at Pebble Beach, set among the Monterey pine groves of Del Monte Forest, Scottish-inspired golf links and the Pacific Ocean. 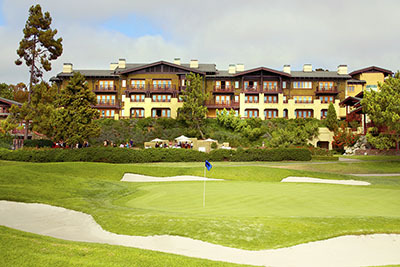 The rambling lodge contains 269 guest rooms and offers access to the Spanish Bay Club facilities, including a fitness center, pool and tennis pavilion. Sedona, Arizona — Seventy-acre resort secluded in a box canyon surrounded by sensational red rock formations, 15 minutes from downtown Sedona. The 218 lodgings come with appealing Southwest-inspired décor. 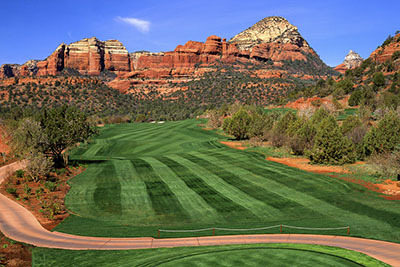 Cooking classes and wine tastings available, plus exclusive access to Tom Weiskopf-designed Seven Canyons golf course. Nayarit, Mexico — Seaside property on a scenic 1,200-acre peninsula with two pretty beaches, 50 minutes north of the Puerto Vallarta airport. A dozen casitas contain 173 guest quarters. Amenities include two magnificent Jack Nicklaus-designed golf courses, reef snorkeling, scuba diving, deep-sea fishing charters and 10 tennis courts. 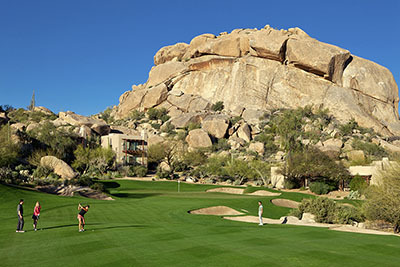 Scottsdale, Arizona — Stylish resort blending into a picturesque high-desert landscape backdropped by Pinnacle Peak, near the celebrated Troon North golf courses in Scottsdale. The enclave offers 199 spacious lodgings in 25 Southwestern adobe casitas, and it's a short drive to Pinnacle and Monument golf courses. Kohala Coast, Hawaii — Renowned 252-room resort overlooking an exquisite white-sand beach on the Kohala Coast. Amenities include a revitalized 18-hole Robert Trent Jones golf course, plus clubhouse, tennis club with 11 courts, 2,500-square-foot fitness center and a new spa with five treatment rooms. 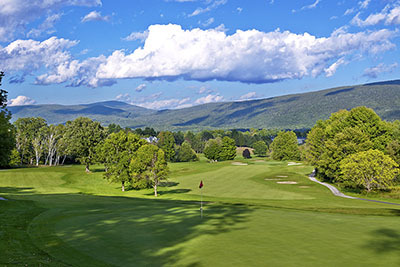 Manchester Village, Vermont — Historic Vermont resort situated in the Manchester countryside. Recent multimillion-dollar renovation featuring well-appointed, modern decor. 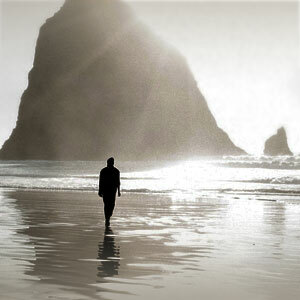 Outdoor activities include biking, hiking, tennis, fishing, horseback riding and skiing. 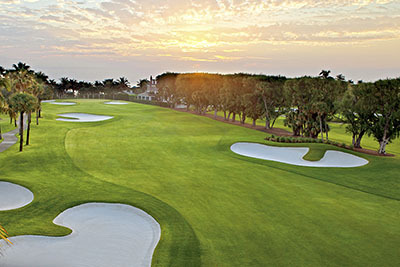 Palm Beach, Florida — Legendary oceanfront resort with Italian-Renaissance décor amid 140 acres. The 538 bright guest rooms and suites are decorated in a tropical palette and provide lavish marble baths. Amenities include two golf courses, a spa, 10 tennis courts, new Ocean Fitness center and a Mediterranean-style beach club. La Jolla, California — Charming resort hotel overlooking the Pacific Ocean in La Jolla, adjacent to the famed Torrey Pines Golf Course and a 2,000-acre seaside nature reserve. The rambling sandstone lodge embodies a distinctive early 1900s California architectural style. 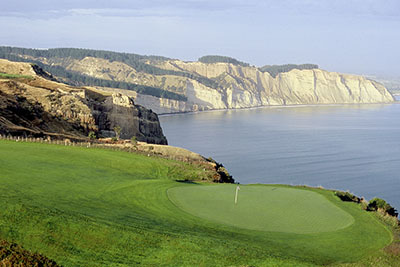 Tee times can be reserved for the two legendary municipal links. 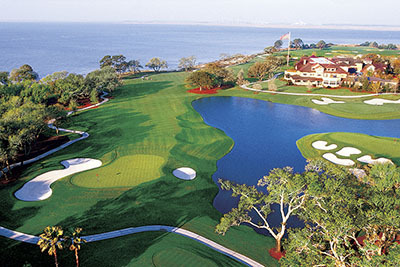 St. Simons Island, Georgia — Tranquil golf-oriented oceanfront hotel situated on the tip of St. Simons Island, adjacent to the spectacular 18-hole championship Plantation links. Forty luxurious guest quarters resemble an English manor house. 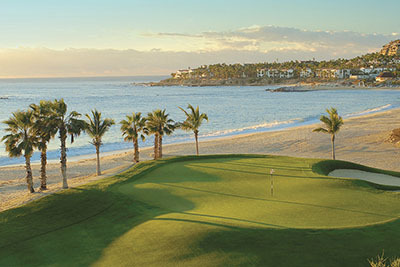 Tee times for all three of the resort’s world-class golf courses can be reserved by guests in advance. 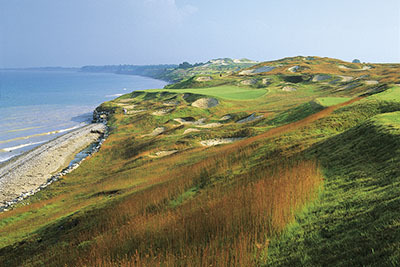 Kohler, Wisconsin — Landmark resort in a village-like setting adjacent to a 500-acre wildlife preserve. A gabled Tudor-style brick manor (listed on the National Register of Historic Places) houses 241 guest rooms with lavish baths. 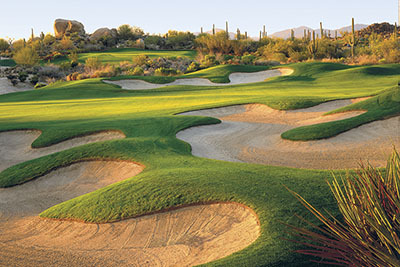 Four spectacular Pete Dye 18-hole championship golf courses; also fitness spa with indoor pool and tennis courts. 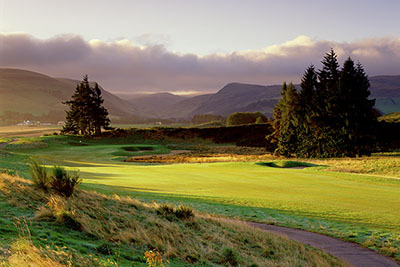 Perthshire, Scotland — Imposing golf resort on an 850-acre estate with three 18-hole championship courses and a sophisticated sports complex, 75 minutes northwest of Edinburgh. The 232 accommodations are done in contemporary or traditional décor. The hotel also features a destination ESPA spa, golf academy, tennis courts and more. 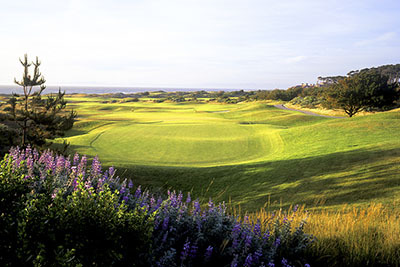 Hawke's Bay, New Zealand — Sister property to the renowned Lodge at Kauri Cliffs set on a 6,000-acre ranch and ideally located for those who want to play the Cape Kidnappers golf course, as well as explore the area’s numerous wineries. The resort’s 22 cottage suites come with extra-spacious baths equipped with separate showers.